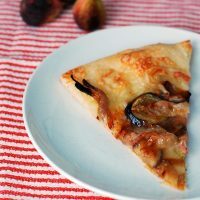 Sweet figs contrast with richly-flavored caramelized onions and salty pancetta on this delicious homemade pizza! Figs are one of those ingredients that I grab when I see them at the grocery store, and figure out what I’m going to do with them later. I saw them at Trader Joe’s while I was on The Quest for the Elusive Red Chile Pepper (read more on that this coming Wednesday): a pound of fresh black figs. I didn’t find my chile peppers, but I bought those figs. Most recipes for figs involve roasting them, wrapping them in pancetta, or eating them with goat cheese or honey. Last year, I made a cake, and a salad with figs. They were delicious (especially the salad! ), but this time, I wanted to do something different, so I put them on a pizza. I decided to pair them with pancetta, since everything is better with pancetta. But I also wanted something else savory to balance the sweetness of the figs. I chose to caramelize a red onion. Why red? Because that’s what I had in my cupboard. At the last minute, I added some chopped fresh rosemary. Ever since I tried the three-cheese, rosemary and pepperoni pizza from Smells Like Home, I’ve believed that every pizza should include rosemary. Did I mention I like rosemary? Dave declared the results delicious, and I agreed. Liam? Not interested in tasting figs. He scraped everything off his slice of pizza, and pretty much just ate baked pizza dough. Oh well. More pizza for us. Melt the butter in a skillet over medium-low heat. Add the onions and cook, stirring every 5 to 10 minutes, for 45 minutes, until onions are soft and caramelized. This can be done up to a day ahead of time. Store in the refrigerator until ready to use. Roll the pizza dough out to a 12-inch circle. Place on a pizza peel generously dusted with cornmeal. 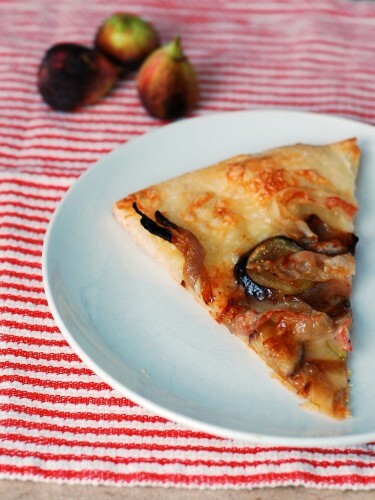 Sprinkle 3/4 of the fontina over the pizza dough, then arrange the figs, pancetta slices and rosemary over top. Sprinkle the remaining cheese over top. I can send you my address and you can mail this to me RIGHT NOW!! lol. This pizza is perfection! I will have to make this next time I see a good carton of figs at the farmer’s market! What a fabulous combination of ingredients for this pizza. Looks great! My father in law is the world’s biggest fan of figs – he’d love this! I would eat so much of that pizza! 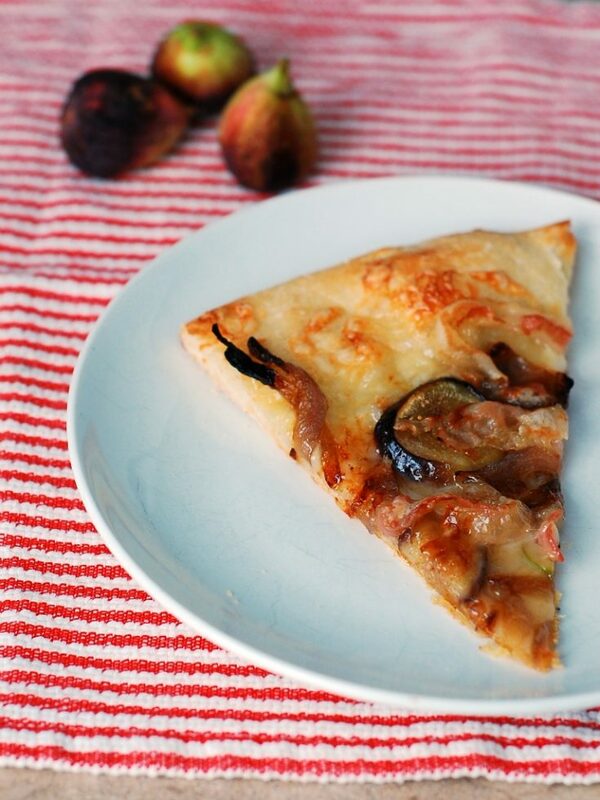 I’ve never tried baking figs or enjoying them on a pizza but it sounds delicious! This is not a combination I’d probably think of on my own and it sounds utterly delicious! Sweet, salty and with a bite. great recipe + flavour combination… thanks for sharing. could definitely go for a couple of slices now! 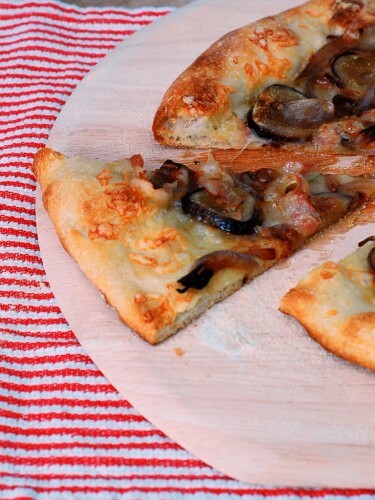 Just looking at your pizza makes me do the happy food dance!I adore figs and gobble them up when in season! What a tasty looking pizza! I’m on a total rosemary kick myself! I’m adding it to (almost) anything these days. Such a great flavor!! This looks like one of those utterly delicious pizzas I’d find at one of the bistros here in Manayunk – but at a fraction of the cost and probably 100times better than what they’d make. Some amazing flavors in this dish – love this recipe! Fig on pizza is my favorite! 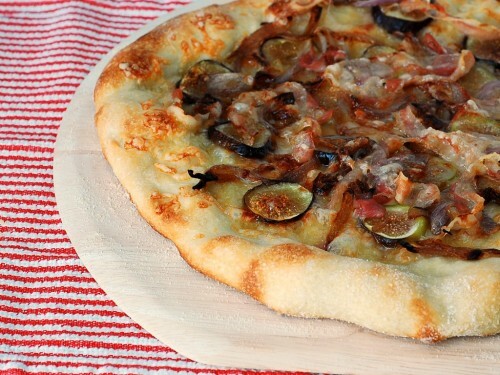 Love figs on pizza! They’re so hard to find around here right now but as soon as I see them, I’ll be making this!